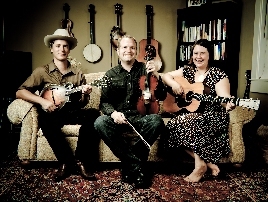 The Foghorn Trio features three musical luminaries in their own rights: Stephen "Sammy" Lind on fiddle, banjo, guitar and vocals, Caleb Klauder on mandolin, guitar, fiddle and vocals and Nadine Landry on guitar, bass and vocals. This latest incarnation of the critically acclaimed Foghorn Stringband has just released its first full-length collaboration, Sud de la Louisiane. It's a sound that could be coming to you from a big console radio in a 1930′s living room, or an Appalachian front porch; instead it's being delivered by a group of players from the thriving old time music scene of Portland, Oregon. Together, they blend voices, repertoire and instruments to create a diverse performance true to the roots of American music, throwing some Cajun and Caleb's vintage sounding originals in the mix. Expect a night of great music with great heart: prepare to be enchanted.